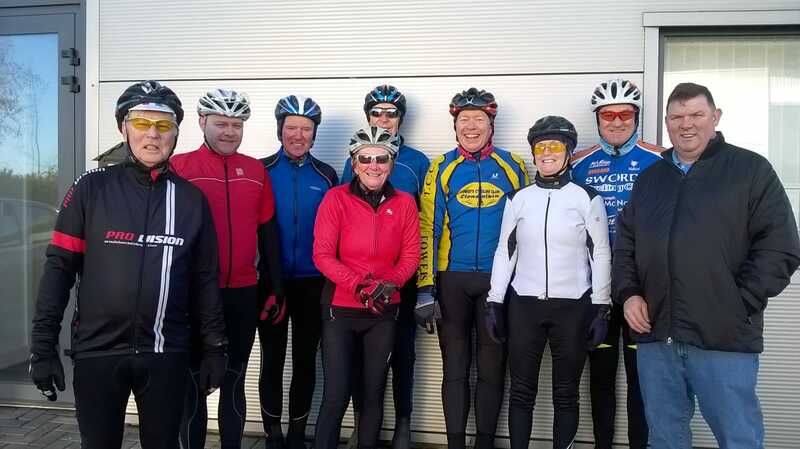 It was a cold, bright morning when the group assembled at Euro Cycles, Airside Retail Park, Swords for the 2019 North Dublin Tour. Nine riders in total signed on for the tour. There might have been ten, but Philip Brogan, one of the league’s regulars, arrived at Airside with a slight back injury. Needless to say, it prevented him from participating in the tour as a rider, but he agreed to marshal the tour as a back up driver. Everyone agreed that it was a noble gesture of Philip to show up on the day and offer to do this, despite his injury. So, thank you Philip. When it was deemed that all participants had arrived, the usual briefing was carried out by yours truly, during which, one of the founding fathers of the leisure league, Gay Farnham, was remembered. A note on observing the rules of the road, and looking out for one’s fellow riders, should they get into difficulty was made. Following the briefing, the customary round of group photographs was carried out, mainly by the leagues unofficial, yet competent photographer, Tony Pearson. His handy work can be seen as part of this report. At approximately two minutes past ten, the group of nine set off from its starting point and made its way through the Airside Retail Parks roads to the junction with the old Belfast road, whereupon it turned left and headed towards the Stockhole Road roundabout, took the third exit and emerged on the eastern perimeter of Dublin Airport. This proved to be the toughest part of the course, despite being so early in the tour. This was because of the exposed nature of the airport, the low temperatures and the fact we were heading into an icy wind. At one point along this stretch of the route two riders fell behind but the rest of the group halted a bit further on until the everyone had regrouped. After this difficult stretch of the tour the group headed towards St. Margaret’s and more sheltered roads. The tour then headed north west on R122, then turned south onto the R121 towards and through Wards Cross roundabout. The tour then turned right towards Hollystown and followed this road for a few kilometres, after which it turned left and headed south towards the Bracetown Business Park. 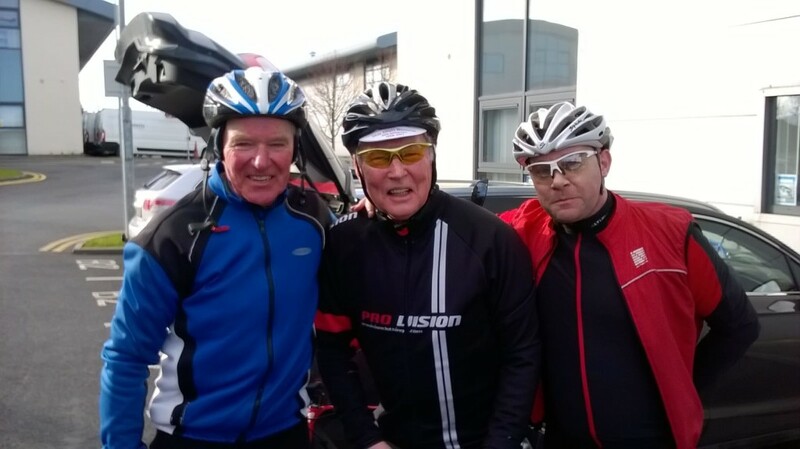 The tour was now in Co. Meath. The tour then headed over the M3 motorway via roundabouts until it reached the old Summerhill road. This was followed for a couple of kilometres and the tour then veered right and headed towards Batterstown at which a well-deserved coffee stop was had by all riders. Following the break, the riders remounted and the tour headed south east along the R154, then north along the R155 heading in the direction of Ratoath. At this point in the tour it was remarked that the cold wind of the first half of the day was now generally at our backs and the temperature of the day was slowly rising. Having negotiated the intricate streets of Ratoath, and some slightly heavy traffic, the tour headed towards Curragha. The tour then headed south east towards Ashbourne but took a sharp left and headed north on the Ballymadun Road. The tour then headed east on scenic country roads towards Ballyboughal. After this the tour headed south on Harlockstown Lane and Balheary Road towards Swords. A quick jaunt on the now traffic busy old Belfast Road led the tour back to its starting point in Airside Retail Park. 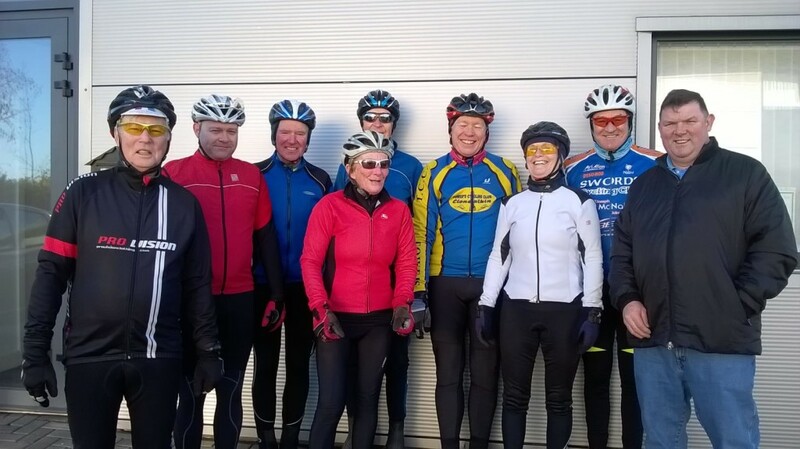 In all a total of 80KM was cycled and all agreed it was a successful days cycling. 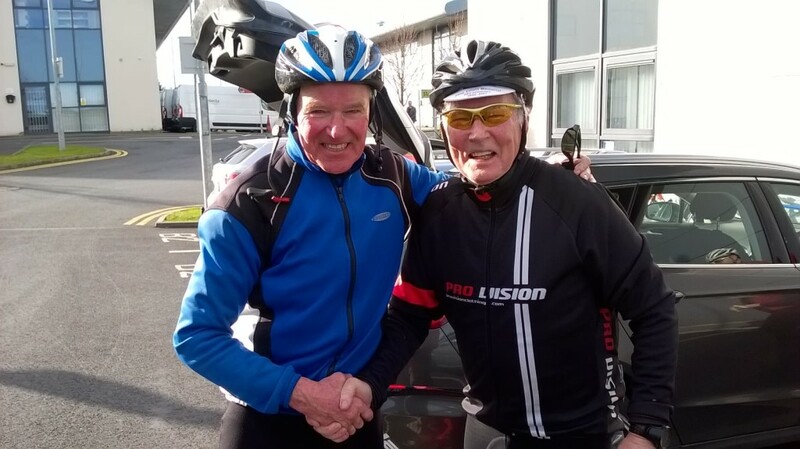 A big thank you to all who participated and especially to Evelyn Doyle, Pat Murphy and Sean Prender who had cycled the route days before to ensure its suitability. 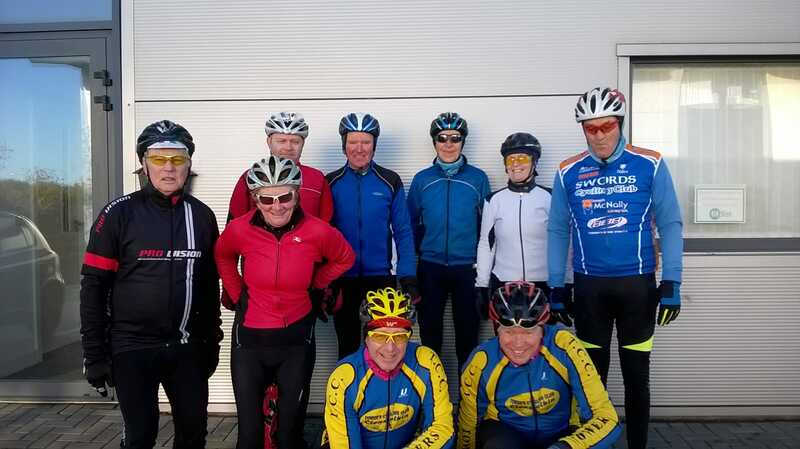 Two league points were awarded to all participant members for this tour. 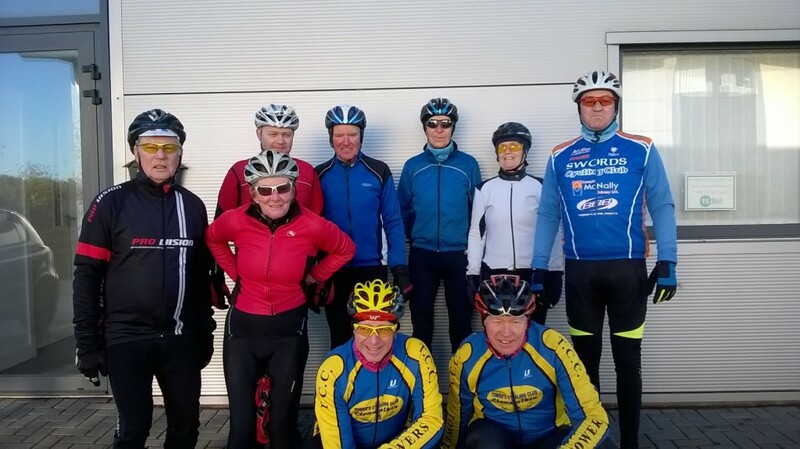 The next tour in the Leisure League will be the 50 in 4 tour from Clonee on March 03rd.